The territory of Northern Rhodesia was administered by the former British South Africa Company from 1891 until it was taken over by the UK in 1923. During the 1920s and 1930s, advances in mining spurred development and immigration. 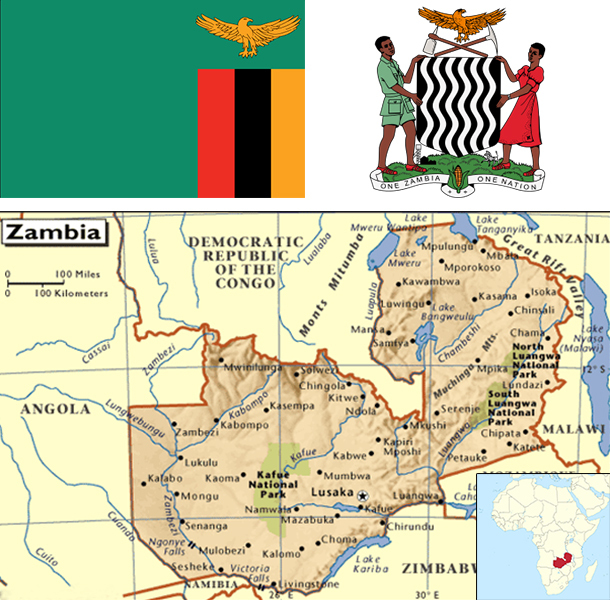 The name was changed to Zambia upon independence in 1964. In the 1980s and 1990s, declining copper prices, economic mismanagement, and a prolonged drought hurt the economy. Elections in 1991 brought an end to one-party rule and propelled the Movement for Multiparty Democracy (MMD) to government. The subsequent vote in 1996, however, saw increasing harassment of opposition parties and abuse of state media and other resources. The election in 2001 was marked by administrative problems, with three parties filing a legal petition challenging the election of ruling party candidate Levy MWANAWASA. MWANAWASA was reelected in 2006 in an election that was deemed free and fair. Upon his death in August 2008, he was succeeded by his vice president, Rupiah BANDA, who won a special presidential byelection later that year. The MMD and BANDA lost to the Patriotic Front (PF) and Michael SATA in the 2011 general elections. SATA, however, presided over a period of haphazard economic management and attempted to silence opposition to PF policies. SATA died in October 2014 and was succeeded by his vice president, Guy SCOTT, who served as interim president until special elections were held in January 2015. Edgar LUNGU won the presidential byelection and will complete SATA's term, which expires in late 2016. Zambia has had one of the world’s fastest growing economies for the past ten years, with real GDP growth averaging roughly 6.7% per annum. Privatization of government-owned copper mines in the 1990s relieved the government from covering mammoth losses generated by the industry and greatly increased copper mining output and profitability, spurring economic growth. Copper output increased steadily from 2004, due to higher copper prices and foreign investment, but weakened in 2014 when Zambia was overtaken by the Democratic Republic of Congo as Africa’s largest copper producer. Zambia's dependency on copper makes it vulnerable to depressed commodity prices, but record high copper prices and a bumper maize crop in 2010 helped Zambia rebound quickly from the world economic slowdown that began in 2008. Despite strong economic growth and its status as a lower middle-income country, widespread and extreme rural poverty and high unemployment levels remain significant problems, made worse by a high birth rate, a relatively high HIV/AIDS burden, and by market-distorting agricultural policies. Economic policy inconsistency and poor budget execution in recent years has hindered the economy and contributed to weakness in the kwacha, which was Africa’s worst performing currency during 2014. Zambia has raised $1.75 billion from international investors by issuing separate sovereign bonds in September 2012 and April 2014, significantly increasing the country’s public debt as a share of GDP. On January 1, 2015, a new mineral royalty tax regime dramatically increased mining taxes, and has led to an economic impasse between the government and the mines. If left intact, the new tax could result in the closure of less profitable mines, the loss of thousands of jobs, and the loss of additional foreign investment.